Isn't he sweet? He is currently in Eastern Europe waiting for his forever family to bring him home. 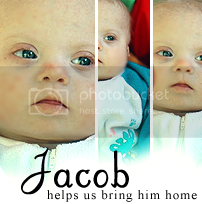 Lucky for Jacob, Brigitte and her family are raising money to bring him home! Jacob is blessed with an extra chromosome ... just like my girls. If he is not adopted by age four, he will become institutionalized. Let's help Brigitte and her family get him home ... soon! So how can we help? Why, I am so glad you asked! Right now, Brigitte and her family are hosting a $10 raffle to win a Wii. I know for us ... we already have a Wii, but I'm thinking that would make a pretty nice gift for $10! Click here to get more information about this great cause. p.s. I stole your post...almost verbatim. I hope that's ok.
We're in! I've also sent the link to my friends and family members.